WholeDude-WholeDesigner: Lord John William Strutt Rayleigh, 3rd baron, 1842-1919, English Physicist, Professor at Royal Institution, London(1887-1905). He provided the theoretical explanation for Sky’s Blue Color. John Tyndall stated that Sky’s Blue color results from the scattering of the Sun’s rays by molecules in the atmosphere. Lord Rayleigh provided the theoretical explanation for Sky’s Blue color. 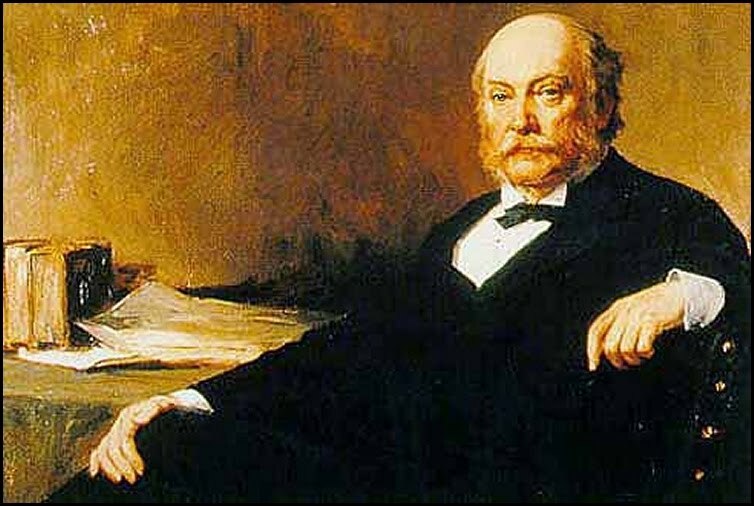 Lord Rayleigh conducted research in Sound(Acoustics), and Light(Optics). He stated the Theory of Wave Propagation of Light. He had received the 1904 Nobel prize in Physics for the discovery of Argon, inert atmospheric gas. 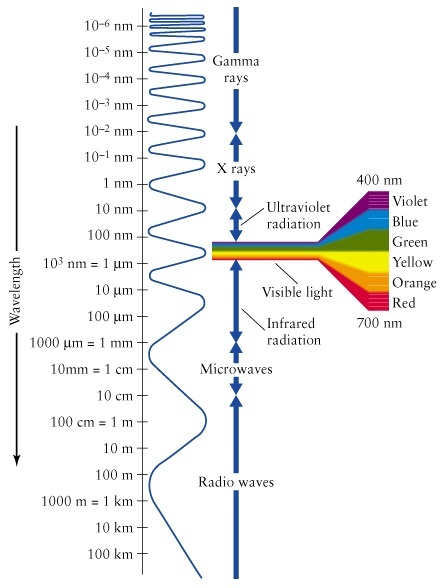 During 1871, Lord Rayleigh published paper about dispersion of electromagnetic radiation by particles that have a radius less than approximately 1/10th wavelength of radiation. WholeDude-WholeDesigner: The wave propagation of Light and the visible spectrum. WholeDude-WholeDesigner: The wave propagation of Light. The scattering effect of submicroscopic particles of the atmosphere. The atmosphere consists of air molecules, dust particles, and water droplets, most of which are small in size by comparison with the wavelength of visible light. The submicroscopic particles of the atmosphere scatter part of the Sun light. 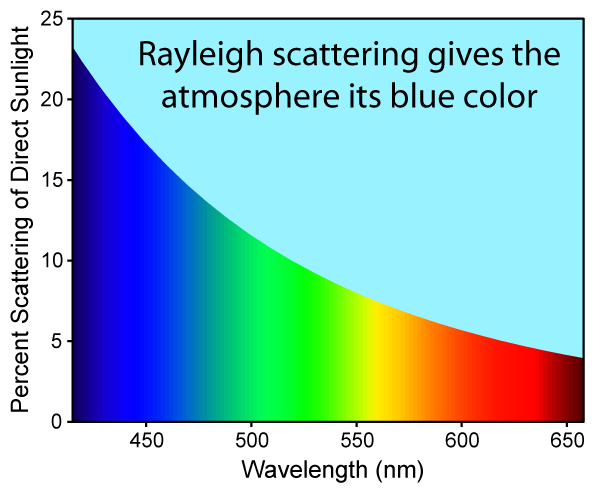 As a consequence, Violet light whose wavelength is 400 nm is scattered more effectively than Red light whose wavelength is 700 nm. The color of the Sky is caused by this selective scattering; the scattered light reaching the observer being predominantly Blue. At Sunrise, and Sunset, the light from the Sun loses its short wavelength components by selective scattering before reaching the observer; and the Sky is therefore Yellow, Orange, or even Red at Sunrise, and Sunset. WholeDude-WholeDesigner: Interference colors from an oil film on water can be related to the thickness of the film. The color seen depends upon the angle of view. 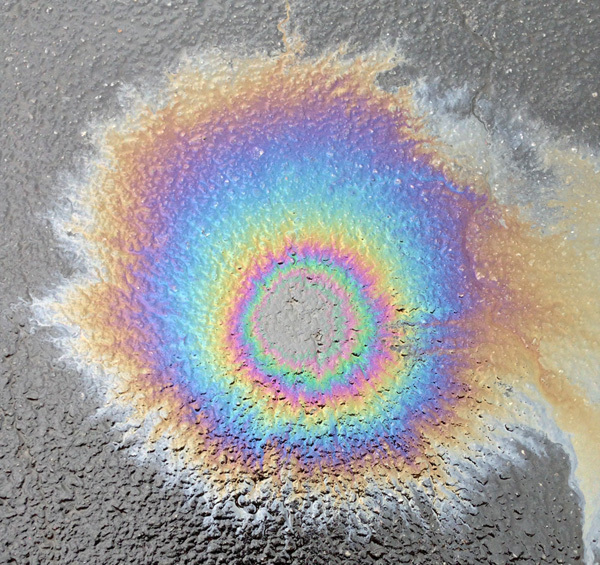 The index of refraction of the oil is greater than that of the water. WholeDude-WholeDesigner: A view of Planet Earth from Lunar surface. 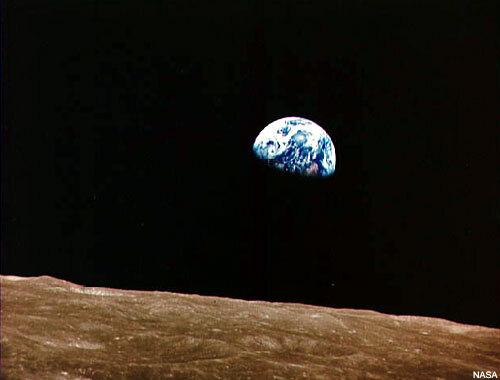 Photo image by Apollo-8 astronaut taken on December 25, 1968. When viewed from the surface of Moon, the Sky appears dark, and Black. The appearance of Sky’s color when viewed by an observer on planet Earth is Blue, and yet this appearance is not common in the vast universe that man has explored. It may be suggested that planet Earth is unique, original, distinct, and one of its own kind of celestial object and it meets the criteria that are required to name an object as a designed object. The fact of Planet Earth’s creation as a designed object could be revealed by the appearance of the color of the Sky when it is viewed from Earth’s surface. The chance of discovering a similar Earth-like Planet appears to be very remote as man has already discovered thousands of planets that exist beyond our Solar System.